Casa Raia sits on a promontory beneath the famed medieval town of Montalcino. The estate once belonged to the patriarchal family of Brunello di Montalcino the Biond Santi. This soil saw the first roots of the Sangiovese vine laboring through inhospitable rock over a century ago. In 1997 the then abandoned farm house was lovingly restored and named Casa Raia after the matriarch of the new family, Raissa Temertey. Vintners Pierre Jean Monnoyer and his wife Kalyna have restored the vineyards with unyielding respect for the land that so generously nurtures us. 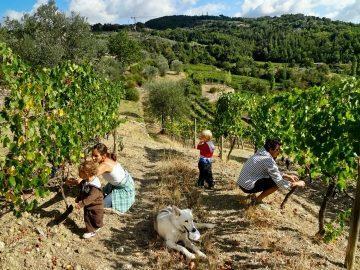 Espousing a philosophy that is best described as "the vine determines the wine" they are producing natural wines that are an expression of their deep commitment to the uncompromising production of authentic, quality wines. James Suckling 90"Intense aromas of clay, spices and dried fruits follow through to a full, chewy palate with lots of tannins and a bark, cedar aftertaste. Need a couple years to soften." James Suckling 90 "Intense aromas of clay, spices and dried fruits follow through to a full, chewy palate with lots of tannins and a bark, cedar aftertaste. Need a couple years to soften."